The Tenders for Kerala's largest project, the Rs 5300 Crore Vizhinjam International Container Transshipment Terminal were received yesterday, in what could be the beginning of the single biggest piece of good news Kerala has had in years. The bidders included some of India's premier developers and some of the world's leading port operators and logistics players. 16 companies in all, arrayed as 5 consortia. 4. M/s Videocon Industries Ltd + Gammon India + Gammon Infra + Sical Logistics. > All consortia have a combination of developers and operators. This shows a well thought-out strategy to consortium formation, ensuring competencies not just in port construction but also in port management. > Each consortium, except for that of Gammon & Sical, have an international partner with considerable expertise in the field of Port Management. > Except for Gammon and Zoom, all the companies are fresh entrants to this round of bidding. > This is the best response to any major project in Kerala so far. In comparison, Vallarpadam only managed two bidders - Dubai Ports and IL&FS (the latter is only an infrastructure financer). Possibly, only the upcoming Technocity project bid may surpass this, as the Developers' Conclave held on January 24th attracted the likes of Emaar MGF, Unitech, K.Raheja Group, Parsavnath, Embassy, L&T, IVRCL, GMR and so on. Considering all this, it seems highly suspect that the Kerala media chose to blithely ignore the announcement of the bid submission, despite the same being announced at a major press conference by Ports Minister, M. Vijayakumar. Except for The Hindu, no paper or local news channel carried the news in detail, despite it being the most important single project Kerala is likely to see for a long, long time. The fact that Vizhinjam can change the face of Kerala like no other project is not lost on anyone with a semblance of intelligence, but still most of the media chose to ditch it in favour of "ground-shocking" items like the red-faced return of a tired, old leader to an equally beat-up party or sordid details of the latest land scam from Kalamassery. A fitting footnote to the historic and criminally underreported news about Vizhinjam would be the wide coverage given, atleast by two prominent Malayalam channels, to the arrival of a super-tanker, the "Star 2", at Kochi Refinery's Single Point Mooring (SPM) platform 22 Kms off Cochin. Much ado was made about the fact that this ship, bearing 280,000 tons of crude, was the first super-tanker to call at Kochi and that the SPM would save KRL over Rs 200 Crores a year. Earlier, I had seen one of Kerala's top newspapers proudly proclaim that this SPM is 22 Kms offshore as compared to others, mostly off the Gujarat coast, which are "merely" 10-15 Kms away from the shoreline. I wonder whether it takes such a Herculean (Einsteinian....is more apt) feat of intelligence to understand the basic fact that a SPM is built at great cost simply because the nearby port (s) do not have the draft to handle supertankers. The further out the SPM, the lower the depth near land, necessitating the location be pushed farther out to sea. Our proud reporter probably didn't understand that the location of the SPM so far out was not a compliment but a damning indication of the shallow draft thereabouts. 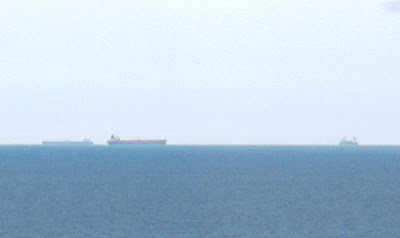 In comparison, the same super-tanker can approach to within two nautical miles of Vizhinjam today, without any dredging or hubbub! With a bit of dredging, leviathans with 20-22 m of draft can be laid up within the harbour with ease. Surprising then that the same channels which took the trouble to send camera teams out in boats 22 Kms out to sea failed to show a single frame from a Minister's press conference shot in the Secretariat, in the heart of the State capital. Pity! That was a good update Ajay.very nicely summarised. Let's hope and pray that finally things will start happening in this regard. I could not agree more with you regarding the stand taken by the local media.I have been trying to find a reason for this type of behaviour from our journalists. May be the reason is that all the local dailies have dedicated business correspondents stationed in Kochi ,only the political ones are stationed in TVM. These political types have no back ground of business reporting and are more comfortable trailing the politicians and reporting about their antics. Hence we have several overenthusiastic business journalists in Kochi who really have nothing much to report except publishing Mumbai news with KOchi by lanes or create hypeover whatever little local developments.The jonnies in TVM can't look beyond UDFs and LDFs. Of course the above is just my own view and may or may not be correct. K.ashok has a very valid point there! But the good news is that Vizhinjam is set to start and lets pray for heavens sake that a land controversy wont kick start along with the project. If something on the lines of Ponmudi or Cybercity surfaces then we are doomed. Good update Ajay, but Vizhinjam is bad news for Keralite business, which still (to be nice and mild) plays second fiddle to the northies. The achayans of Kottayam, for example, still depend on the north for their Johnnie Walker. These creeps cannot look beyond their nosetips. And again, the media is controlled by the big boys from Amchi Mumbai, for which place Vizhinjam is nothing less than a nightmare. Which dignified paper wants a kick up his (you know where). Vizhinjam will, if channelised properly, undo the flow of workforce to Mumbai and the Gulf. So why report on something that is beneficial to Trivandrum and directly hit Kochi, Kozhikode and Mumbai. Better to lick the Northern master's feet, than stand with the spine holding strong. I am not surprised.